This is me at 11:33 pm. I didn't change anything about the photos, and I didn't change anything about my appearance before I took them. 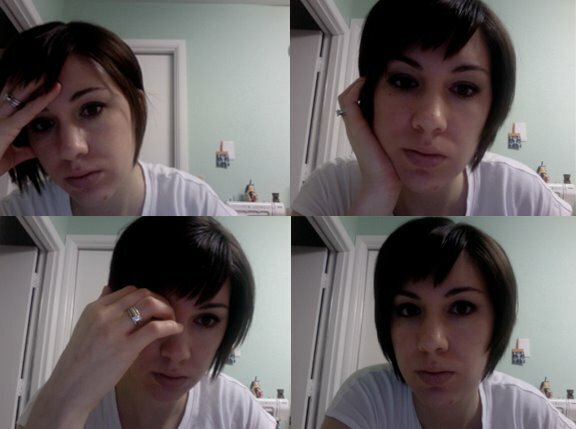 In fact, I took random screen shots of myself from my computer's built-in camera as I was tweaking some blogger HTML for a friend. I'm tired. I have a pimple. I have no lipstick on (which has been known to elicit comments such as "Are you feeling sick today?" No, I just have pale lips. Jeez.). Sure, my hair is done, my eye makeup, too. But I had a doctor's appointment (which is the only exciting reason lately to do my hair and eyes, it seems). So why the late night photo shoot? I recently received an e-mail from a sweet friend. She explained how I look so "under control and happy and beautiful." Which is lovely to hear, and very generous, indeed. But I felt a little guilty, especially because I think this was making her feel like she was lacking some of those qualities as of late. Number One: She's not (which I explained with many well-cited , bona fide examples)! Number Two: Shame on me. Blogdom gives a false impression, sometimes. And I have fallen victim to the lures of showcasing a perfectly happy existence some days. I know I share some of the hardships of my day-to-days, as well. But I also realized that in my ever-increasing blogging lapses, I have been posting more of the happy. This is easy to do. I say to myself, "I'll post those super cute pics that I just stole off my friend's blog of us playing the other day. That will be an easy post!" I opt for ease. I do it for two reasons. Number One: I have zero time to do anything else except barely make it through the mayhem around here (babies, moving...moving, babies). Number Two: It helps me focus on the bright and perfect moments—small, wonderful successes. • I yelled at Finn in the car. Well, not yelled, but Maya was screaming, and Finn was hollering for a french fry. So I had to "yell" over Maya, "FINN. JUST. WAIT. A. SECOND. FOR. GOODNESS. SAKES!!!!" Or something to that effect. Sorry Finn. • This morning at 5am while I had Maya's diaper off for changing, she pooped, then peed. Allllll over everything. Then I picked her up and she spit up. Allllll over me. There is a sound I make when I am exasperated that Wes hates. I made that sound. Loudly. • Maya has Acid Reflux. The doctor determined that yesterday. She is super cranky when she is awake. So I spent probably 4 hours tonight bouncing her on the balance ball, while Finn tugged on my yelling "GO!!!!!" He had dirty hands and feet. A wet diaper. He refused to eat a decent dinner (which led to the french fry fiasco). Maya was spitting up all over herself, and I hadn't eaten because I was trying to help Maya not freak out. Wes was gone for the evening. I called to find out when he was coming home (I am way too dependent on him). He said, "How have you not eaten tonight?!" Which set me into the mode of spouting off all my random reasons/excuses as to why not. Then I hung up and cried because I was so tired. Man! Not under control. Any of it. I could probably keep going, but my little flock of following sheep over there in the sidebar might start to dwindle, as they start to un-follow around bullet point 2. So I will spare the rest of the details. Suffice it to say, I have a lot of times during the day when it's total mayhem. I feel dizzy just thinking about how many times I have to run after Finn to pick up his trail of toys on the off chance that someone will call and want to look at the house. I loved seeing my friend, Katy's, Reality Check post. It makes me feel more connected to her as a mom and woman. It makes Katy real. It's hard to let all of Blogdom know that I might be hanging by a thread of sanity some days. Especially when it's a small vignette of my life and persona that is coming through. I was thinking today that I wanted to start a private blog (because I am terrible at a written journal) about a few things that happen during the day that go perfectly. A successful attempt at bottle-feeding (still to be seen), nipping a tantrum in the bud (getting better at this one), accomplishing all of the ironing (happened last Sunday), etc. It's like keeping a gratitude journal. And when I look back on it, I am sure I will beam at all of my accomplishments, rather than dwell on the frustrating moments when I said, "I never do anything for me." Because really in the end it is all for me. I just have to look at it from the right angle. I did have many small successes today. I will remember all of them in my prayers tonight. I want to list them out. Then I will realize how many more of them there actually were. And hopefully that will help me get a tiny bit better at keeping it real, and somewhat under control at the same time. Now go post a photo of yourself at the end of your long day! It's 1:09 am. I just posted mine. I have a pimple on my chin too, but I snapped my picture exactly how I was sitting while reading your post....so it is covered a little. Loved your post. I have a passion for keeping it real because of the very reason you wrote. Not keeping it real sets people up for feeling like failures. But also, focusing on the positives do help create more positive environments. It is a fine line, but one I strive to keep balanced. Nice job on keepin' it real. I loved it! And P.S. delete my email. please. you my friend have your plate seriously full and I got my situation straightened out! You ARE so real, and I love that! Even if most of your pics are taken/posted when you're looking your finest, that's ok. I think that speaks volumes about the self-respect you have and how you take care of yourself. I love the message that you share...you're a mom & wife, you work from home, you keep a clean household, AND you take care of yourself. I see too many mommies every week that seem to have given up on themselves all in the name of motherhood. The best thing all of us mothers can do is to find the balance where you can do the good things your family needs but still take care of number one. You do that amazingly well! I admire your strength and perseverance! I often look at my blog and wonder if I am being too "everything is all sunshine and roses." and other times I wonder if I am being too "doom and gloom" and complaining about everything. I try to balance writing equally about the good and the bad, but sometimes I get off track. :) I know how crazy things can get with small kids, I have four of them, and one had tummy issues and cried for the first 3 months of her little life. :) Things will get easier, hang in there!!! OH Lyndz! I had a punch in the stomach kind of day yesterday too, and Mike is out of town for the week. I am really missing you these days my friend. If only there weren't a whole country between us, it would be nice to depend on and support each other in person instead of just the blogger-sphere. I'm here for moral support if you need me. Thanks. I needed that today and am planning to write a similar post the minute I get a chance. Oh,and I forgot to mention, I wrote a post awhile back in which I inserted a picture of me "as is" in the morning. She's lying! She has the perfect life: 10 hours of sleep every night, breakfast in bed from Finn and Maya, and a husband that's home all the time to help. ...well at least the last one. You are a strong capable woman. I think you are great for posting those photos. I am made ill by the entire "my life is perfect" show that some bloggers put on. One blogger, who I will not name, often overly shares how perfect her relationship is. I don't believe that for a moment, it always makes me lose respect for people. Bless your heart re: moving & babies. I wish I lived in AZ, I would help you! Acid reflex is scary, you are doing so well. Thank YOU for keepin' it real. Amen. And Amen! Thanks Lyndsay- I love reading your blog, and I'm sorry you had such a long, rough day! Isn't it funny how a reminder that life is just hard sometimes, for everyone, can make you feel better though? I like the idea of writing down your accomplishments for the day, I think I would need to carry a notepad around with me for that because sometimes I lay in bed at night trying to think of anything I accomplished that day and come up empty.